Half of the population complains that the other half isn't listening while the other half is complaining that they are not heard. Why do we often feel cut off when speaking to the people closest to us? What is it that keeps so many of us from really listening? Paul Donoghue and Mary Siegel have studied the ways that people don't listen and answer these questions and more in this thoughtful, witty, and helpful look at the reasons people don't hear one another. 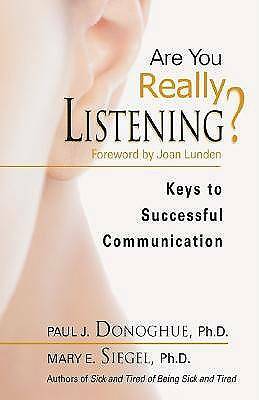 Filled with examples that clearly demonstrate easy-to-learn techniques for becoming a better listener, Are You Really Listening? is a guide to listening and being listened to.